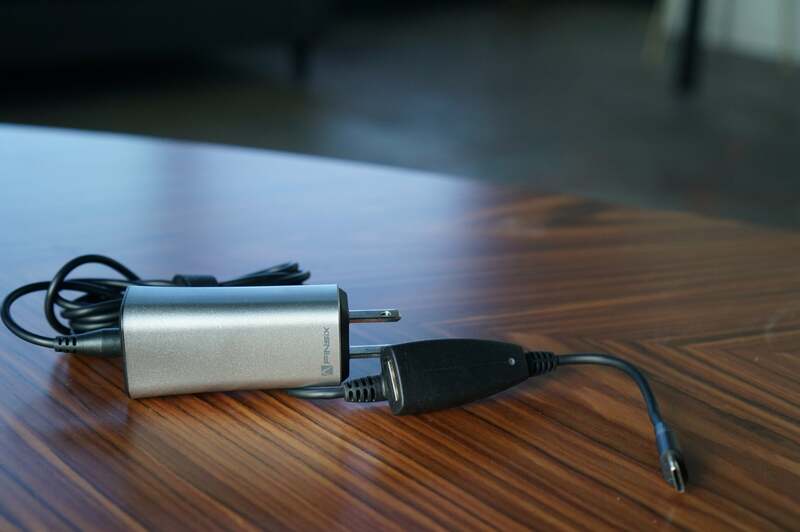 If you accidentally left your USB-C laptop charger during a layover at Batman Airport (yes, it’s real), consider yourself lucky, because you now have an excuse to upgrade to a much sexier, much lighter power brick, like the Finsix Dart-C (available for preorder for $99.99). I can’t confirm Finsix’s claim that this is “The World’s Smallest Laptop Charger,” but damn, is it small (approximately 2.5 x 1 x 1 inches) and it punches well above its weight. As its name implies, the Dart-C is a USB-C Power Delivery (PD) charger, so it’s compatible with most devices that use the reversible USB-C port. A second USB Type A charging port is integrated into the cable. The placement of the second port looks clumsy but fortunately doesn’t add much to the overall weight. There’s also a small LED that glows when the brick is powered up so you know you didn’t forget to plug it in. 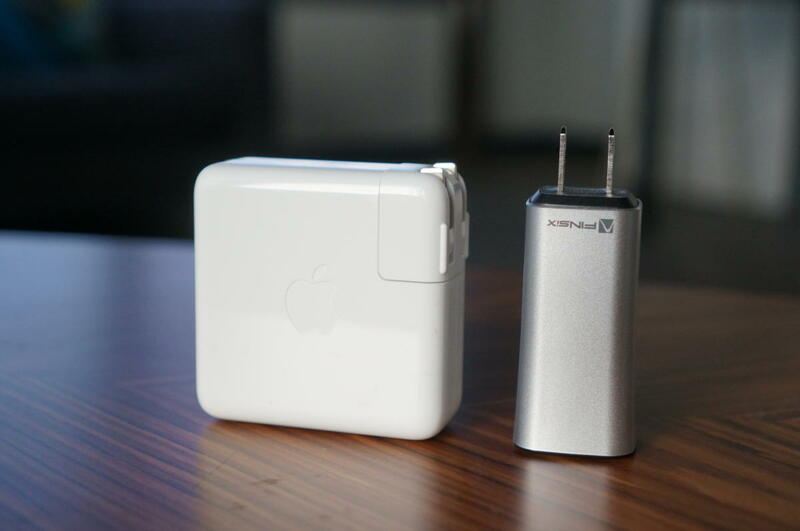 The Dart-C (right) will output 65 watts of power, which is 4 watts more than the larger and heavier Apple MacBook Pro 13 charger (left). Despite it being really not much larger than a cell phone charger, the Dart-C is rated at 65 watts of output, which can power most 13-inch, and smaller, laptops (and even some 15-inch laptops). Finsix says a very high-frequency power technology helps make the Dart-C so small. That comes with a cost, though: With a retail price of $100, it’s even pricier than Apple’s power bricks, which themselves carry a premium. 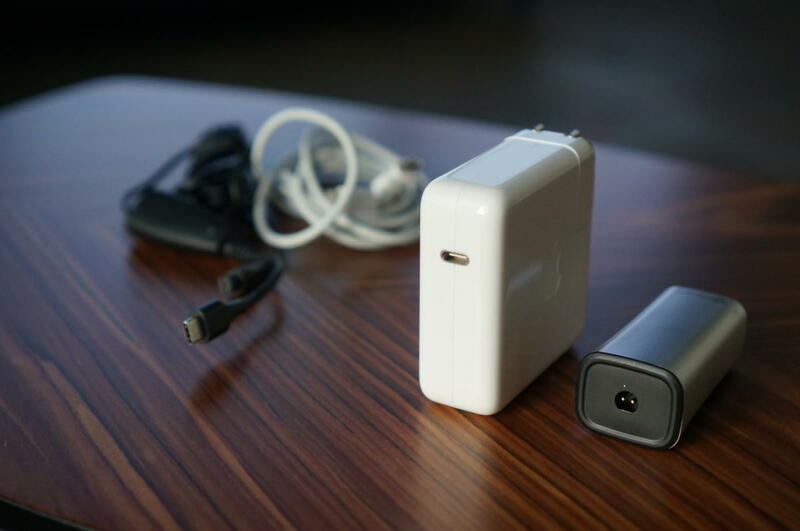 Finsix says the higher cost is offset by the fact that Apple's power brick is bigger and heavier by comparison and doesn’t actually come with a USB-C cable. That means you have to pay $69 for the 61-watt brick and then another $19 for the USB-C cable. PC chargers are generally cheaper than that, but not always by much. The best price I could find for a replacement Asus Zenbook 3 charger was $70. 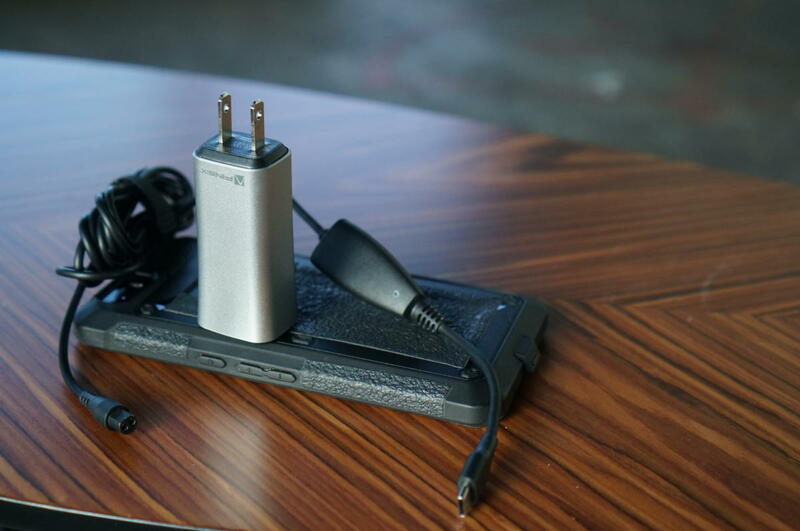 HP and Dell’s chargers push $60, if you can even find them in stock. While some PC chargers come close to the weight of the Dart-C, the typical wall wart puts out a lot less power and is much bulkier. The Dart-C features a proprietary cable with an inline USB Type A port that can output 2 amps. Because USB-C Power Delivery hasn’t exactly had a smooth launch, I wanted to see just how many laptops the Dart-C would actually work with. I gathered up seven different laptops (the same ones used in my previous USB-C charging showdown) from Apple, Google, Lenovo, Acer, HP, Asus, and Dell—companies that represent 80 percent of the notebook market. I added a couple of USB-C phones: the Huawei-made Nexus 6P and Google Pixel XL. 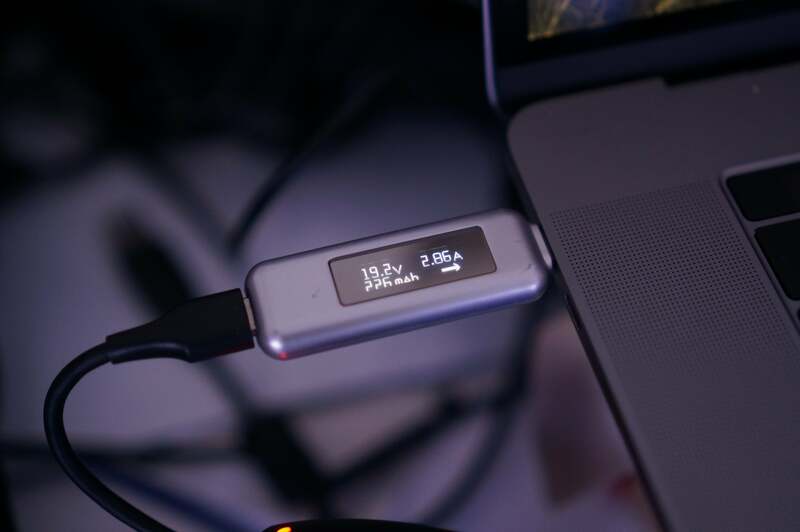 I used a Satechi USB-C power meter to measure the charge rates on each device. 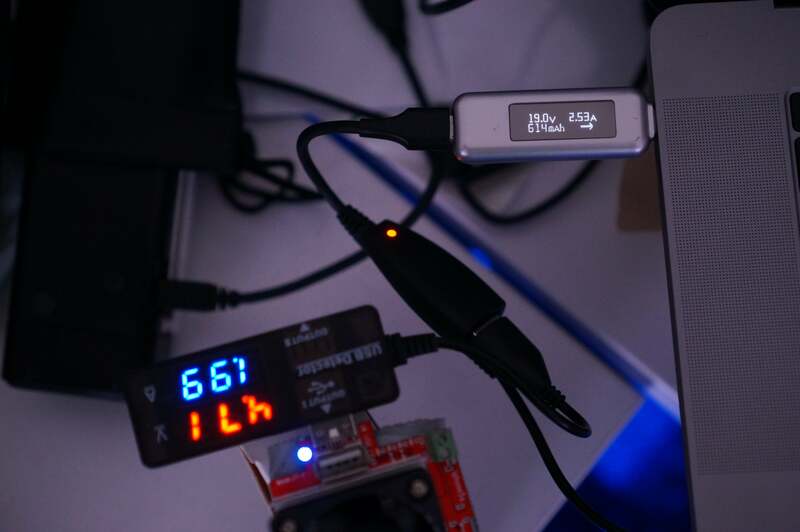 We measured output using a USB-C power meter. While I had no issues with most of the laptops I tested, two coughed up furballs. The first was the HP Spectre x360 13t. HP plays it super-safe, issuing a risk warning when a non-HP charger is being used, but it doesn't prevent the Dart-C from doing its job. I also discovered that when the Dart-C was plugged into the laptop but not the wall, HP's laptop would slow to a crawl. A BIOS update did not change the behavior, which I also duplicated multiple times on a second Spectre laptop. But when the Dart-C was tethered to a power outlet, the laptop charged up as normal. Is this a deal-breaker? Probably not. It's quite evident when the performance slows down, and simply plugging the cord into an outlet or unplugging the Dart-C from the laptop returns the Spectre's performance to normal. FINsix’s Dart-C charger on top of a Nexus 6P. We encountered more severe problems with Google’s Chromebook Pixel. The Dart-C simply would not charge the Pixel if I plugged the charger in when the Chromebook was booted into the OS. Even worse, the Dart-C subsequently failed to work with any of the other laptops it had previously worked with. Initially I thought the charger had died. It wasn’t until I unplugged the cable from the charger's body and then plugged it back in that the charger was revived. I could reproduce the “dying” repeatedly, and a second review unit from Finsix exhibited the same issue. Even more confusing, I found that plugging the Dart-C into the Google Chromebook Pixel while it was sleeping and then waking it would work, but unplugging it and plugging it back into the Pixel while active would “brick” the unit. Because the Chromebook Pixel has been discontinued, Finsix says it won't sweat it. Chromebook Pixel owners, be warned. After our review ran, FINsix said it had been in communication with Google about the problem and had decided to address the try.SRC issue in an updated cable that will ship with all Dart-C chargers going forward. We've asked for the new cable to retest the Pixel chromebook's support and will post any updates. FINsix’s Dart-C isn’t perfect (yellow squares indicate minor issues; red indicate major ones) but its size, weight, and power output make it worth consideration. The good news is that my issues with the Spectre and Pixel didn't surface anywhere else. In the chart above you'll see that, for the most part, charge rates were as expected. Despite the two hiccups (with the HP’s being fairly minor), the Dart excelled in voltage support. USB Power Delivery, or USB-PD, has been a TMZ-worthy messy affair, with ever-shifting “profiles,” and now “rules,” changing every few months. As we understand it, the new rules require that USB-PD chargers support 20 volts, 15 volts, 9 volts, and 5 volts. Any lower voltage “rails” below the high one must support a minimum of 3 amps. Additional voltage rails, such as 12 volts, are now optional. 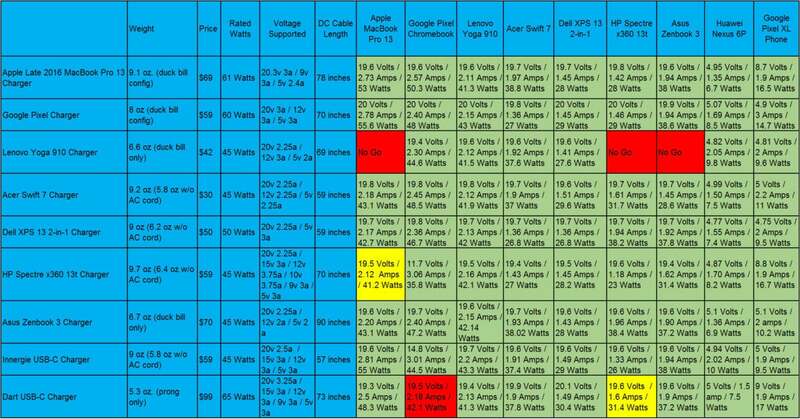 In the Voltage Supported column in the chart above, you can see that few of the OEM chargers support the latest rules. To get a “better” charger, you basically want one that supports more varied voltage rails with a minimum of 3 amps. The vast majority of them simply don’t support all the needed rails nor put out enough power to charge higher-demand devices such as phones or tablets properly. For example, Google’s Pixel XL, which can fast-charge at up to 18 watts, would be underserved by the chargers here that fall below 11 watts. Those laptop chargers, which can reach 45 watts or higher on a laptop, would charge the Pixel XL at a far slower rate than the wall wart that comes with it would. The Dart-C? It had no problems charging the Pixel XL at just about its maximum of 17 watts. In fact, of all of the chargers in the chart, only the HP and Dart-C seem to support the current USB-PD Rules. We ran the Dart-C above its rated 65 watts by also putting a 2-amp load on the USB Type A charger, while charging a MacBook Pro 15 with the screen on max and a game running in the background. One concern people have about tiny power bricks is the heat they generate. To test that with a worst-case scenario, I plugged the Dart-C into a MacBook Pro 15, set the screen to its maximum brightness, and then cranked up a game on the GPU to consume even more power. To make things even more challenging, I added a controlled 2-amp load to the USB Type A port on the Dart-C. 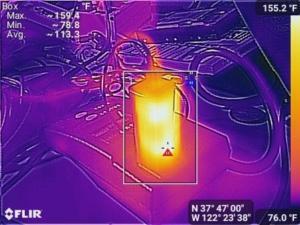 This thermal image shows just how toasty the Dart-C can get when pushed really, really hard. Running the Dart-C at 75 watts (which is above its stated 65 watt rating) for an hour, I measured parts of the brick hitting 159 degrees Fahrenheit. That’s pretty toasty, but not enough to hurt you. Plenty of power bricks I’ve used before get nearly as hot. Under a more normal load of about 38 watts, the body was warm but a far more tolerable 122 degrees Fahrenheit. The good news is I didn’t note any power drop-off, even while heated up. Clearly the functionality is there. The question is—is it worth it? As a replacement for a lost OEM charger, or even a secondary unit, the answer is yes. The minimal weight and bulk of the Dart-C is truly liberating. It’s so light, I’d slip it into my bag just to charge my Nexus 6P. And if I needed to carry a laptop around, such as the HP Spectre x360 13t, I’d know I already had a charger with me. The MacBook Pro 13 features a USB Type C port, while the Dart-C features a proprietary plug. While a USB-C port may seem preferable, you could have issues with a low-quality cable. That's avoided with the Dart-C.